5/7/2004 11:05:59 AM Mountain TG:: keeping stop very tight at 1109 now, action looks week. 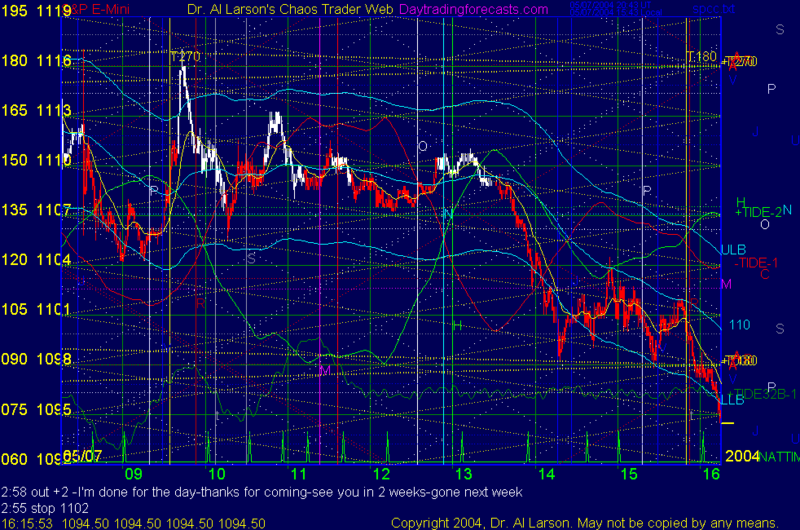 5/7/2004 10:58:41 AM Mountain TG:: 12:40-45 est has marked 1 day cycle low last two days, may have done so again today. Time frame was also on a natural time today, so bought 8.5 with a tight stop as price was holding above 20 Exma, a little anticipatory of 20/110 break. 5/7/2004 8:32:43 AM Mountain Greg:: Yes, that was great trading! It is a good day. 5/7/2004 8:21:54 AM Mountain TG:: Wow, fireworks early. Missed initial big run up but got +5 on oob sell so not too bad. Nice trading Al.